Lasers cancel atmospheric turbulence and give scientists clearest view of large starry clusters to date. Star gazing just got a whole lot better thanks to five green lasers punching a pentagon pattern 15 miles high in the sky. Devised by an astronomy team in Arizona and funded by the National Science Foundation, scientists have created a method to get crisper views of larger swaths of the night sky. “The technologies we’re investigating will be crucial to the full scientific exploitation of the next generation giant telescopes,” said Michael Hart, an astronomer at the University of Arizona, Tuscon who led the study. The technique goes something like this: Astronomers angle five lasers from a telescope mount to form a pentagon in the sky. The light is then reflected back to the telescope aperture in the lowest layer of the atmosphere. Then software picks out the common blurry portions and adjusts for it dynamically, canceling out the blur caused by atmospheric ripples, and giving astronomers a clear view. The method is different from earlier techniques involving just one laser and mirrors. And, when used with the European Extremely Large Telescope, the Giant Magellan telescope and other still-in-development “superscopes,” will allow scientists to get more accurate readings on galaxies that are older and farther away. The data points scientists gather about those old galaxies will help us better understand the origins of the universe. So, why five points? No, it doesn’t have anything to do with support from the Department of Defense or, you know, Magick. The number needed to be odd: three was too few and seven was “too crowded,” according to Hart. Hart said his team was able to stay on budget (the NSF awarded them $1.6 million in 2005 for the project) in large part because they searched for cheaper equipment. 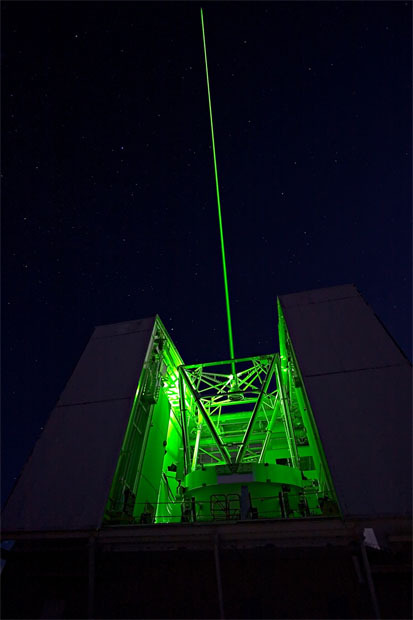 In the past, astronomers have used specialized lasers costing about $5 million and shooting 60 miles in the sky. Hart’s team picked up lasers used in the semiconductor industry for $70,000 a piece and configured them to shoot 15 miles in the sky.